Originally published under the title "Insult after Injury: Understanding Egypt's 'Reconciliation Meetings'." 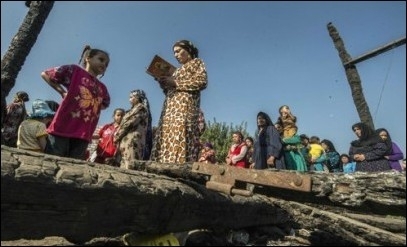 Egyptian Christians in the village of Ismailia attend mass last month in the ruins of a makeshift chapel burned down earlier this year. We often hear about Egypt's Christians being attacked by Muslim mobs. What we rarely hear about is what happens afterwards. Are the culprits imprisoned? Are the victims compensated? Do authorities take measures to help prevent such attacks from happening again? First, the attack itself is often based on the accusation that some Christian dared overstep his bounds, that is, he broke Islam's supremacist dhimma contract. Security forces take their time getting to the scene of anti-Christian mob attacks. For example, after 3,000 Muslims rose in violence against the Christians of a village near Alexandria in 2012, it took the army an hour to arrive—even though it was stationed a mere mile away: "This happens every time," said a Christian eyewitness. "They wait outside the village until the Muslims have had enough violence, then they appear" (Crucified Again, p. 175). After the uprising has fizzled out, authorities arrive. Instead of looking for and arresting the culprits or mob ringleaders—or, as often is the case, the local imam who incites the Muslim mob against the "uppity infidels" who need to be reminded of "their place"—authorities gather the leaders of the Christian and Muslim communities together in what are termed "reconciliation meetings." During these meetings, Christians are asked to make further concessions to angry Muslims. Authorities tell Christian leaders things like, "Yes, we understand the situation and your innocence, but the only way to create calm in the village is for X [the offending Christian and extended family, all of whom may have been beaten] to leave the village—just for now, until things calm down." Or, "Yes, we understand you need a church, but as you can see, the situation is volatile right now, so, for the time being, maybe you can walk to the church in the next town six miles away—you know, until things die down." Needless to say, things never "die down" or "return to normal." Christians who agree to banishment are seldom allowed reentry and churches rarely resume being built, for the mob will rise up again. But when they rebuff the authorities' offer and demand their rights as citizens against the culprits, the authorities smile and say "okay." Then they go through the village making arrests—except that most of those whom they arrest are Christian youths. Then they tell the Christian leaders, "Well, we've made the arrests. But, just as you say so-and-so [Muslim] was involved, there are even more witnesses [Muslims] who insist your own [Christian] youths were the ones who began the violence. So, we can either arrest and prosecute them, or you can rethink our offer about having a reconciliation meeting." Under the circumstances, dejected Christians generally agree to the further mockery. What alternative do they have? They know if they don't their youth will certainly go to prison and be tortured. In one recent incident, wounded Christians who dared fight against Muslim attackers were arrested and, despite serious injuries, held for seven hours and prevented from receiving medical attention. In some 100 pages the book reviews how the security apparatus in Egypt chooses to 'reconcile' the culprits and the victims in crimes where churches are burned; Coptic property and homes plundered, and Copts themselves assaulted, beaten and sometimes murdered; and when even monks are not spared. Even though it stands to reason that such cases should be seen in courts of law where the culprits would be handed fair sentences, this is almost never allowed to take place. And even in the few cases which managed to find their way into the courts, the culprits were never handed fair sentences since the police invariably fell short of providing any incriminating evidence against them. Politically speaking, the authorities aim—through the reconciliation sessions—to secure a rosy façade of the 'time-honoured['] amicable relationships between Muslims and Copts', implying that they live happily ever after. The heartbreaking outcome, however, is that the only winners in these sessions are the trouble mongers and fanatics who induce the attacks in the first place and who more often than not escape punishment and emerge victorious. The Coptic victims are left to lick their wounds.